In September of 2010 at age 75, Betty M. Wells started a new career. At the time, she didn’t realize that she’d been training for this job for 30 years. 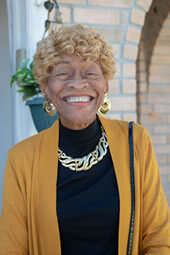 After all those years in housekeeping at Ochsner Medical Center, Betty was thinking about retiring. But she is so good with people, they couldn’t let her go. Instead, they created a new position for her. She was now Ochsner’s official greeter. Betty says taking this job was one of the best decisions she’s ever made. She is energized by helping others. Those people she greets? Most are patients or family or friends of patients – troubled by their situations and their immediate futures. But Betty has a way of taking the edge off for them. She has a way of making their day a little brighter, a little more hopeful. Over the course of eight decades, Betty has learned that the things you say, the things you do, can have a great impact on others. “It hurts me and upsets me when people are hurting,” she says. She’s learned that she has the capacity to relieve some of that hurt. And she’s learned not to worry about how big or small of a problem a person faces or who that person is; she gives them her attention as though there was nothing more important for her to do at that moment. Those helping moments start well before dawn for Betty. Her shift may officially start at 6 a.m., but she gets there early. She gets there at 4:30. Because surgeries start at 5, and those people coming in really need a little help and a little happiness. Betty’s always had a comfortable way of engaging people, but as she’s gotten older, her sense of hope has gotten stronger, her optimism more contagious. And optimism is good medicine in a hospital. When you see Betty, you’ll notice her hospital uniform jacket is studded with pins – all gifts of thanks from people she’s touched in some way. Each pin has its own story, and in each of those stories is a lesson of excellence through experience. Betty has six of those story-covered jackets, and she’s getting ready to start her seventh.